Hairworms are known for their ability to make their host go for an impromptu (and terminal) swim in a stream or a pond, but by doing that they are not just sending ripples through the water, but also into the surrounding ecosystem. The paper we are looking at today features a species of hairworm from Japan call Gordionus chinensis - this parasite infects three different species of forest-dwelling camel crickets from the genus Diestrammena. The scientists who conducted the study that this paper is based on wanted to find out what happens to the the cricket population and their hairworm parasites after their home forest has been cut down. They conducted an observational field study at an experimental forest in the upper parts of the Totsu River at Nara Prefecture, Japan. The forest was originally clear-cut in 1912 and 1916 and since then, parts of it have been replanted and cut down at different point in time over the last century. Each study site corresponds with a different replanted forests of Japanese cypress ranging from 3 to 48 years old. These scientists found that the camel crickets began returning a few years after a forest has been replanted, their abundance steadily increasing and eventually reaching a peak after the forest has been standing for at least 30 years. But their hairworm parasites did not return with similar gusto. In fact, they estimated that only second-growth forests that are more than 50 years old have hairworm populations that are as abundance as those found at undisturbed sites. One possible reason for the hairworms' slow recovery is their complex life cycle which requires infection of more than one host. The replanted forest might be lacking some of the other host G. chinensis needs to complete its life cycle. Because parasites has such a negative public image, a forest which is free of parasites (or at least a specific parasite) might sound good to most people. But these hairworms actually play a very vital role in the ecosystem. By causing their cricket host to jump into a stream, they actually serve as a kind of fast food delivery service for the fish living in those streams. 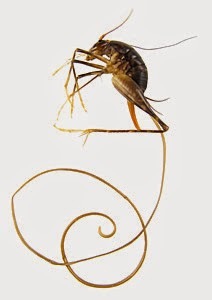 A cricket infected with a hair worm is 20 times more likely to stumble into a stream and become fish food than an uninfected cricket - so fish which would not usually get to feed on such large land-loving insects on a regular basis can now do so thanks to the hairworm, and it has calculated that this straight-to-your-stream food delivery service accounts for 60% of the trout population's energy intake in some watersheds. For hairworms, new forests just do not have the same creature comforts of old forests. And if you are a keen angler or simply appreciate a fish-rich stream - you have a parasite to thank for all the fishes. Sato, T., Watanabe, K., Fukushima, K., & Tokuchi, N. (2014). Parasites and forest chronosequence: Long-term recovery of nematomorph parasites after clear-cut logging. Forest Ecology and Management, 314: 166-171. For a parasite, the host provides provides food, shelter, and a site for reproduction - in short, a complete habitat. While for some parasites, host death is a necessary condition for the parasite to complete its life-cycle, for others, the death of a host amounts to the end of the world (or a sinking ship at the very least). Meet Daubaylia potomaca, a roundworm which infects the freshwater snail Helisoma anceps. Unlike other roundworms that use snails as vehicles to reach the next host in their life-cycle, the snail is the only hosts for D. potomaca. But seeing as snails do not live forever, any parasite it harbours would need an exit strategy or risk perishing with their host when the end finally comes. For a parasite like D. potomaca which completes its entire life-cycle in the snail, it would be useful for it to recognise when they should abandon their host. A dying host is not the only reason to leave - finding a new host is integral to most parasites' life-cycle, but you would not want to leave too early either - the outside world is a hostile place and as a parasite, you would want to get as much out of the host as possible before you make a run for it. Unlike most other parasites that usually infect a new host as larval stages, D. potomaca actually leave their hosts as fully-matured females laden with eggs, all tangled in mucus-coated bundles composed of 10-50 worms. Therefore the female worms would not want to depart too early as it needs to gather as much resources as possible from its host to nurture the developing eggs. So ideally, they leave it to the last possible moment before they emerge from the snail. So how well does D. potomaca time its escape? In the paper we are featuring today, a team of researchers studying this host-parasite system observed some worms leaving as early as 52 days before their host snail died, but the majority (almost a quarter) of the worms came out in the last five days of the snail's life. The percentage of worms that emerged increased as the snail's life draws closer to its end - it seems almost as if the parasite can sense when the host is near death's door and took that as a cue for when to bail. As an additional factor, the researchers also found that infection intensity of D. potomaca affected the snail's lifespan - the more heavily infected it is, the sooner the snail dies. So perhaps D. potomaca can also gauge how crowded the inside of the host is, and schedule their departure accordingly. This is some what reminiscent of a parasite previously featured on this blog; Coitocaecum parvum. Unlike D. potomaca, C. parvum is a fluke with a complex life-cycle and infects multiple hosts through out its life. However, it does face the potential problem of its amphipod host dying before it is eaten by the parasite's next host, in this case a freshwater fish where it can mate with other flukes and produce eggs. But if become increasingly unlikely that its amphipod host would be eaten by a fish before it expires, C. parvum would alters its usual life history schedule to start producing eggs in the amphipod instead of waiting until it end up in the gut of a fish (which might not happen). While it is a different kind of response to imminent host death compared with D. potomaca, it is another example of how parasites can assess the status of its host and the surrounding environment, and adjust their own life schedule accordingly. Throughout the course of co-evolving with their hosts, in addition to adapting to their host's defences, parasites have also developed many strategies to ensure their survival even as their environment (i.e. the host) faces imminent collapse. Zimmermann, M. R., Luth, K. E., & Esch, G. W. (2013). Shedding Patterns of Daubaylia potomaca (Nematoda: Rhabditida). Journal of Parasitology 99: 966-969.